Potentially prominent new additions that would add to Downtown Santa Monica's modest skyline remain contentious. Following last Friday’s horrific tragedy, the national media spotlight that followed, and another unrelated shooting soon after, some semblance of normalcy returned to Santa Monica last week with a council session punctuated by contentious land use agenda items and familiar debates about development. To be perfectly honest, it felt a little surreal to slip back into listening to disputes about things like appropriate building heights downtown after the past week’s events, but the process of shaping the city’s future continues on. The first major item for discussion included a first reading of an amendment to adopt tweaked language to the interim zoning ordinance, the ordinance that has temporary changed a few things in our zoning code, in accordance with the land use and circulation plan, but preceding the complete overhaul of the zoning code that is underway. Next up, was the first reading for an ordinance to update the language of the city’s affordable housing production program. The new ordinance is based on recommendations from the housing commission and includes a new category for “extremely low-income”, or 30% of the average median income. With Santa Monica having a higher median income than the region as a whole, the absence of this category meant the policy directed affordable housing being created before was still out of reach for those who have the hardest time affording to live here. New rent limits were also created to ensure “moderate income” restricted housing is below market rates. Tweaks to the affordable housing program formula were overdue, but the accessibility of Santa Monica is going to remain difficult if we do not keep pace with housing construction or conversions that include housing. New housing units enable us to set aside proportions to low income designations and helps address the market rate supply and demand, and housing to jobs imbalances, which are significant forces driving up rents. In much of the local editorializing about housing in Santa Monica I feel there is a conspicuous absence of discussing market forces despite our existence in a predominately market based system, and our strict rent control decades in the past for all but a select group of long time residents. What really stumps me is when the same voices complain about rising rents and oppose new housing construction in the same breath, as though supply had no relation to the price dynamic. 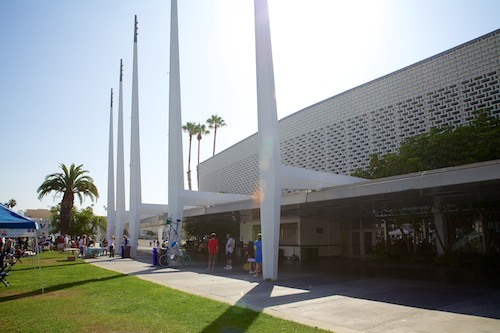 The fate of the aging Santa Monica Civic Auditorium was also up for discussion, and how to preserve it in light of the redevelopment money being pulled that was slated for revamping it to meet earthquake codes and improving amenities. The facility has also had revenues that are below the cost of upkeep and staffing. The Urban Land Institute released a report (pdf) with various options and budget scopes for preserving the civic. Some have objected to the idea of land at 4th and Pico might be developed to help raise revenue, and have insisted the area be exclusively for open park space, including former mayor and council member Mike Feinstein who alluded to past discussions for the area that included open space at that corner. I haven’t taken a strong stance on what I’d like see happen, but I’m open to a range of proposals or hybrid approaches to reimagining the site, which currently devotes a vast sea of land use to an asphalt surface lot that is dreadful to walk along coming from the Pico & 4th side. The building is landmarked and mayor Pam O’Conner assured everyone that demolition is not on the table, and addressing concerns over developing the adjacent surface lot to help support the Civic, elaborated that the land is fully owned by the city and as such is in control of what happens. There would be extensive public process for any proposal. The council directed staff to move forward with developing plans for interim uses of the facility, and to set up a public committee that would help guide and focus the long term process of making the Civic a vibrant and economically viable cultural center once again. 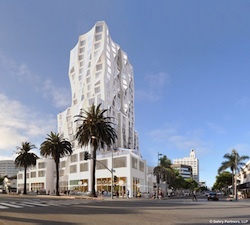 Frank Gehry designed proposal at Ocean & Santa Monica. Extending the discussion well into the night was item 13-C, a council member discussion item proposing a motion to direct staff to only move forward developer agreements that are within the height restrictions of the previous land use plan. This motion, from Kevin McKeown and supported by Ted Winter and Tony Vasquez was a response to the highly motivated backlash from some residents opposed to float up proposals that included towers that exceed current height restrictions at several locations in the downtown known as opportunity sites. At these sites, developers have pitched ideas beyond the scope of existing zoning, in exchange for offering the potential for more significant community benefit contributions as well as higher general revenues. Which as I understand it has been employed extensively in Vancouver Canada, attaching height to community benefit contributions. The Frank Gehry designed proposal for the corner of Santa Monica Blvd. & Ocean Ave. is one of the more high profile projects to be considered so far. After public comments pro & con (with more supporting the motion attending), the council got into debates along familiar lines on development, scale, city budgets and vision for the downtown area. In the end there wasn’t the 4th vote to pass the motion to push back consideration on the project proposals with Pam O’Conner, Bob Holbrook and Gleam Davis opposed to delay, and supporting continued public dialogue through the float up process for these potential projects. Although I tend to fall on the side of supporting new pedestrian oriented development within the transit accessible Santa Monica core, I admit I’ve not been particularly wild about what has been proposed at the potential “opportunity sites” so far. I’m more interested in seeing housing opportunities downtown than lots of new hotel rooms, and the designs so far could use further iteration if they are to be so prominent. Personally, I’m open to seeing & considering DA proposals with some height in the context of downtown, and what might come out of a public process with the city in a position of leverage and no guarantee of approval. However with loud and persistent opposition growing toward any consideration of allowing higher buildings, even if only potentially on a few sites, I’m sure this will remain a heated issue if some of these proposals are not brought down in size in following iterations. Why housing instead of hotel rooms? Seems like we could use the jobs . . .